A cigarette is a small cylinder of finely cut tobacco leaves rolled in thin paper for smoking. The cigarette is ignited at one end causing the cigarette to smoulder and allowing smoke to be inhaled from the other end, which is held in or to the mouth; in some cases, a cigarette holder may be used, as well. Most modern manufactured cigarettes are filtered, and also include reconstituted tobacco and other additives. The term cigarette, as commonly used, refers to a tobacco cigarette, but can apply to similar devices other substances, such as cannabis. A cigarette is distinguished from a cigar by its smaller size, use of processed leaf, and paper wrapping, which is normally white, though other colors and flavors are also available. Cigars are typically composed entirely of whole-leaf tobacco. Rates of cigarette smoking vary widely throughout the world and have changed considerably since cigarettes were first widely used in the mid-19th century. While rates of smoking have over time leveled off or declined in the developed world, they continue to rise in developing nations. Cigarettes carry serious health risks, which are more prevalent than with other tobacco products. Nicotine, the primary psychoactive chemical in tobacco and therefore cigarettes, is very addictive. About half of cigarette smokers die of tobacco-related disease and lose on average 14 years of life. Cigarette use by pregnant women has also been shown to cause birth defects, including low birth weight, fetal abnormalities, and premature birth. Second-hand smoke from cigarettes has been shown to be injurious to bystanders, which has led to legislation that has prohibited smoking in many workplaces and public areas. Cigarettes produce an aerosol containing over 4,000 chemical compounds, including nicotine, carbon monoxide, acrolein, and other harmful substances. Over 50 of these are carcinogenic. Cigarettes are a frequent source of fires leading to loss of lives in private homes, which prompted both the European Union and the United States to ban cigarettes that are not fire-standard compliant from 2011 onwards. The widespread smoking of cigarettes in the Western world is largely a 20th-century phenomenon. At the start of the 20th century, the per capita annual consumption in the USA was 54 cigarettes (with less than 0.5% of the population smoking more than 100 cigarettes per year), and consumption there peaked at 4,259 per capita in 1965. At that time, about 50% of men and 33% of women smoked (defined as smoking more than 100 cigarettes per year). By 2000, consumption had fallen to 2,092 per capita, corresponding to about 30% of men and 22% of women smoking more than 100 cigarettes per year, and by 2006 per capita consumption had declined to 1,691; implying that about 21% of the population smoked 100 cigarettes or more per year. Since 1950, the average nicotine and tar content of cigarettes has steadily fallen. The fall in nicotine content has led to smokers inhaling larger volumes per puff. Beginning on April 1, 1998, the sale of cigarettes and other tobacco products to people under the state purchase age has been prohibited by law in all 50 states of the United States. The purchasing age in the United States is 18 in 44 of the 50 states — but 19 in Alabama, Alaska, New Jersey, Utah, and Nassau, Suffolk, and Onondaga Counties in New York, and 21 in California, Hawaii, and more than 180 municipalities across the nation. The intended effect of this is to prevent older high school students from purchasing cigarettes for their younger peers. Legislation was pending as of 2004 in some other states. In Massachusetts, parents and guardians are allowed to give cigarettes to minors, but sales to minors are prohibited. Cigarettes are a significant source of tax revenue in many localities. This fact has historically been an impediment for health groups seeking to discourage cigarette smoking, since governments seek to maximize tax revenues. Furthermore, some countries have made cigarettes a state monopoly, which has the same effect on the attitude of government officials outside the health field. In the United States, cigarettes are taxed substantially, but the states are a primary determinant of the total tax rate. Generally, states that rely on tobacco as a significant farm product tend to tax cigarettes at a low rate. 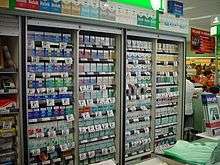 Higher prices for cigarettes discourage smoking. Every 10% increase in the price of cigarettes reduced youth smoking by about 7% and overall cigarette consumption by about 4%. Thus, increased cigarette taxes are proposed as a means to reduce smoking. Coupled with the federal cigarette tax of $1.01 per pack, total cigarette-specific taxes range from $1.18 per pack in Missouri to $8.00 per pack in Silver Bay. States also charge sizable settlement payments to tobacco companies, and the federal government levies user fees to fund FDA regulatory measures over tobacco. While these charges are not cigarette-specific, tobacco companies are ultimately forced to pass on those costs to their consumers. Lastly, most jurisdictions apply sales tax to the full retail price of cigarettes. As of April 2011, Australian regulations require all packs to use a bland olive green, with 75% coverage on the front of the pack and all of the back consisting of graphic health warnings. The only features that differentiate one brand from another are the product name in a standard color, standard position, and standard font size and style. New Zealand, Canada, and the United Kingdom have considered similar policies. In response to these regulations, Philip Morris International, Japan Tobacco Inc., British American Tobacco Plc., and Imperial Tobacco attempted to sue the Australian government. On August 15, 2012, the High Court of Australia dismissed the suit and made Australia the first country to introduce brand-free plain cigarette packaging with health warnings covering 90 and 70% of back and front packaging, respectively. This took effect on December 1, 2012. One of the chemicals on the list, ammonia, helps convert bound nicotine molecules in tobacco smoke into free nicotine molecules. This process, known as freebasing, enhances the effect of the nicotine on the smoker. Second-hand smoke is a mixture of smoke from the burning end of a cigarette, and the smoke exhaled from the lungs of smokers. It is involuntarily inhaled, lingers in the air hours after cigarettes have been extinguished, and can cause a wide range of adverse health effects, including cancer, respiratory infections, and asthma. Nonsmokers who are exposed to second-hand smoke at home or work increase their heart disease risk by 25–30% and their lung cancer risk by 20–30%. Second-hand smoke has been estimated to cause 38,000 deaths per year, of which 3,400 are deaths from lung cancer in nonsmokers. Sudden infant death syndrome, ear infections, respiratory infections, and asthma attacks can occur in children who are exposed to second-hand smoke. Scientific evidence shows no level of exposure to second-hand smoke is safe. The benefits and the health risks of e-cigarettes are uncertain.> There is tentative evidence that they can help people quit smoking, but they have not been proven better than regulated medication. Their usefulness in tobacco harm reduction is unclear, but they could form part of future strategies to decrease tobacco related death and disease. Their safety risk to users is similar to that of smokeless tobacco. Regulated nicotine replacement products are safer than e-cigarettes, but e-cigarettes are probably safer than smoking. 1 2 "Cigarette Smoking Among Adults - United States, 2006". Cdc.gov. Retrieved 2009-11-13. 1 2 "WHO/WPRO-Smoking Statistics". Wpro.who.int. 2002-05-28. Archived from the original on November 8, 2009. Retrieved 2009-11-13. ↑ Doll, R.; Peto, R.; Boreham, J.; Sutherland, I. (2004). "Mortality in relation to smoking: 50 years' observations on male British doctors". BMJ (Clinical research ed.). 328 (7455): 1519. doi:10.1136/bmj.38142.554479.AE. PMC 437139 . PMID 15213107. ↑ "Les cigarettes anti-incendie seront obligatoires en 2011". L'Express.fr (in French). L'Expansion. AFP. Retrieved January 2, 2010. According to a study made by European union in 16 European countries, 11,000 fires were due to cigarettes between 2005 and 2007. They caused 520 deaths and 1600 injuries. ↑ Proctor, R. N. (2006). "Angel H Roffo: The forgotten father of experimental tobacco carcinogenesis". Bulletin of the World Health Organization. 84 (6): 494–496. doi:10.2471/BLT.06.031682. PMC 2627373 . PMID 16799735. ↑ Hammond D, Fong GT, McNeill A, Borland R, Cummings KM (June 2006). "Effectiveness of cigarette warning labels in informing smokers about the risks of smoking: findings from the International Tobacco Control (ITC) Four Country Survey". Tob Control. 15 Suppl 3 (Suppl 3): iii19–25. doi:10.1136/tc.2005.012294. PMC 2593056 . PMID 16754942. ↑ "Les cigarettes anti-incendie seront obligatoires en 2011" (in French). Lexpansion.com. Retrieved 2009-11-13. ↑ "Ontario set to ban cigarette display cases". CTV News. 2008-04-20. Retrieved 2009-01-31. The new ban prevents all tobacco products from being displayed in any way and prohibits customers from even touching them before they're paid for. ↑ Binesh, Fatemeh (2011). "The Importance of Cigarette Pack as Brand Image". ↑ Warning on cigarette pack . Tobacco in Pakistan. ↑ "Iceland Tough On Cigarettes - Sun Sentinel". Articles.sun-sentinel.com. 1985-09-17. Retrieved 2013-01-02. ↑ David Pemberton, "Spies, Smoking & Radiation Sickness". ↑ "How to Roll Your Own Filter Cigarettes: 6 Steps (with Pictures)". wikihow.com. Retrieved 2014-02-14. ↑ Sluaghter E, Gersberg RM, Watanabe K, Rudolph J, Stransky C, Novotny TE (2011). "Toxicity of cigarette butts, and their chemical components, to marine and freshwater fish". Tobacco Control. 20: 25–29. doi:10.1136/tc.2010.040170. 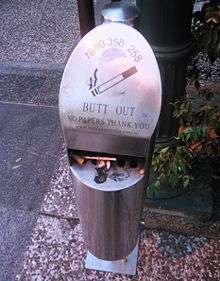 ↑ "The Facts About Cigarette Butts and Litter - Fire Danger". CigaretteLitter.Org. Retrieved 2009-11-13. 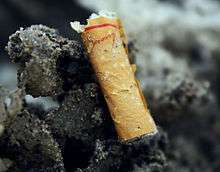 ↑ "Can cigarette butts start bushfires? - NSW Fire Brigades". Nswfb.nsw.gov.au. 2007-06-21. Retrieved 2009-11-13. ↑ Gou, JY; Miller, LM; Hou, G; Yu, XH; Chen, XY; Liu, CJ (January 2012). "Acetylesterase-mediated deacetylation of pectin impairs cell elongation, pollen germination, and plant reproduction". Plant Cell. American Society of Plant Biologists. 24: 50–65. doi:10.1105/tpc.111.092411. PMC 3289554 . PMID 22247250. ↑ "photosensitization - chemistry". Encyclopedia Britannica. Retrieved 30 May 2015. ↑ "Accidents, fires: Price of littering goes beyond fines". Washington: State of Washington Department of Ecology. 2004-06-01. ↑ Cigarette numbers from WHO , population from: China: China Population Information and Research Center (estimate?) "Archived copy" (PDF). Archived from the original on 2015-04-21. Retrieved 2008-08-02. , USA: US Census estimate , Japan: National Statistics Center intercensal estimate , Russia: Population Reference Bureau , Indonesia: average of 1995 and 2000 figures from Statistics Indonesia "Archived copy" (PDF). Archived from the original on 2015-04-21. Retrieved 2008-08-02. , all accessed on 2 August 2008. Per capita consumption given to 3 significant figures. Archived April 21, 2015, at the Wayback Machine. ↑ Pu X, Kamendulis LM, Klaunig JE (2009). "Acrylonitrile-induced oxidative stress and oxidative DNA damage in male Sprague-Dawley rats". Toxicol. Sci. 111 (1): 64–71. doi:10.1093/toxsci/kfp133. PMC 2726299 . PMID 19546159. ↑ Koturbash I, Scherhag A, Sorrentino J, Sexton K, Bodnar W, Swenberg JA, Beland FA, Pardo-Manuel Devillena F, Rusyn I, Pogribny IP (2011). "Epigenetic mechanisms of mouse interstrain variability in genotoxicity of the environmental toxicant 1,3-butadiene". Toxicol. Sci. 122 (2): 448–56. doi:10.1093/toxsci/kfr133. PMC 3155089 . PMID 21602187. 1 2 3 4 Chapman S, MacKenzie R (2010-02-09). "The global research neglect of unassisted smoking cessation: causes and consequences". PLoS Medicine. Public Library of Science. 7 (2): e1000216. doi:10.1371/journal.pmed.1000216. PMC 2817714 . PMID 20161722. ↑ Chapman, Simon; MacKenzie, Ross (February 9, 2010). "The Global Research Neglect of Unassisted Smoking Cessation: Causes and Consequences". PLoS Medicine. Public Library of Science. 7 (2): e1000216. doi:10.1371/journal.pmed.1000216. PMC 2817714 . PMID 20161722. 1 2 3 Benowitz NL; Benowitz, Neal L. (2010). "Nicotine addiction". N Engl J Med. 362 (24): 2295–303. doi:10.1056/NEJMra0809890. PMC 2928221 . PMID 20554984. 1 2 3 Orellana-Barrios, Menfil A.; Payne, Drew; Mulkey, Zachary; Nugent, Kenneth (2015). "Electronic cigarettes-a narrative review for clinicians". The American Journal of Medicine. doi:10.1016/j.amjmed.2015.01.033. ISSN 0002-9343. PMID 25731134. 1 2 3 Grana, R; Benowitz, N; Glantz, SA (13 May 2014). "E-cigarettes: a scientific review.". Circulation. 129 (19): 1972–86. doi:10.1161/circulationaha.114.007667. PMC 4018182 . PMID 24821826. ↑ Pepper, J. K.; Brewer, N. T. (2013). "Electronic nicotine delivery system (electronic cigarette) awareness, use, reactions and beliefs: a systematic review". Tobacco Control. 23 (5): 375–384. doi:10.1136/tobaccocontrol-2013-051122. ISSN 0964-4563. PMID 24259045. ↑ Farsalinos KE, Spyrou A, Tsimopoulou K, Stefopoulos C, Romagna G, Voudris V (2014). "Nicotine absorption from electronic cigarette use: Comparison between first and new-generation devices". Scientific Reports. 4: 4133. doi:10.1038/srep04133. PMC 3935206 . PMID 24569565. ↑ Cheng, T. (2014). "Chemical evaluation of electronic cigarettes". Tobacco Control. 23 (Supplement 2): ii11–ii17. doi:10.1136/tobaccocontrol-2013-051482. ISSN 0964-4563. PMC 3995255 . PMID 24732157. ↑ Weaver, Michael; Breland, Alison; Spindle, Tory; Eissenberg, Thomas (2014). "Electronic Cigarettes". Journal of Addiction Medicine. 8 (4): 234–240. doi:10.1097/ADM.0000000000000043. ISSN 1932-0620. PMID 25089953. ↑ Brandon, T.H. ; Goniewicz, M.L. ; Hanna, N.H.; Hatsukami, D.K. ; Herbst, R.S. ; Hobin, J.A. ; Ostroff, J.S. ; Shields, P.G. ; Toll, B.A. ; Tyne, C.A. ; Viswanath, K.; Warren, G.W. (2015). "Electronic Nicotine Delivery Systems: A Policy Statement from the American Association for Cancer Research and the American Society of Clinical Oncology" (PDF). Clinical Cancer Research. 21: 514–525. doi:10.1158/1078-0432.CCR-14-2544. ISSN 1078-0432. PMID 25573384. 1 2 Harrell, P.T. ; Simmons, V.N. ; Correa, J.B.; Padhya, T.A. ; Brandon, T.H. (4 June 2014). "Electronic Nicotine Delivery Systems ("E-cigarettes"): Review of Safety and Smoking Cessation Efficacy.". Otolaryngology—head and neck surgery : official journal of American Academy of Otolaryngology-Head and Neck Surgery. 151: 381–393. doi:10.1177/0194599814536847. PMID 24898072. 1 2 Drummond, M.B. ; Upson, D (February 2014). "Electronic cigarettes: Potential harms and benefits". Annals of the American Thoracic Society. 11 (2): 236–42. doi:10.1513/annalsats.201311-391fr. PMID 24575993. 1 2 Caponnetto P.; Russo C.; Bruno C.M. ; Alamo A.; Amaradio M.D. ; Polosa R. (Mar 2013). "Electronic cigarette: a possible substitute for cigarette dependence". Monaldi archives for chest disease. 79 (1): 12–19. doi:10.4081/monaldi.2013.104. PMID 23741941. ↑ Fernández, Esteve; Ballbè, Montse; Sureda, Xisca; Fu, Marcela; Saltó, Esteve; Martínez-Sánchez, Jose M. (2015). "Particulate Matter from Electronic Cigarettes and Conventional Cigarettes: a Systematic Review and Observational Study". Current Environmental Health Reports. 2: 423–9. doi:10.1007/s40572-015-0072-x. ISSN 2196-5412. PMID 26452675. ↑ Farsalinos, K. E.; Polosa, R. (2014). "Safety evaluation and risk assessment of electronic cigarettes as tobacco cigarette substitutes: a systematic review". Therapeutic Advances in Drug Safety. 5 (2): 67–86. doi:10.1177/2042098614524430. ISSN 2042-0986. PMC 4110871 . PMID 25083263. 1 2 Polosa, R; Campagna, D; Caponnetto, P (September 2015). "What to advise to respiratory patients intending to use electronic cigarettes.". Discovery medicine. 20 (109): 155–61. PMID 26463097. ↑ Orellana-Barrios, Menfil A.; Payne, Drew; Mulkey, Zachary; Nugent, Kenneth (2015). "Electronic cigarettes-a narrative review for clinicians". The American Journal of Medicine. doi:10.1016/j.amjmed.2015.01.033. ISSN 0002-9343. PMID 25731134. ↑ Callahan-Lyon, P. (2014). "Electronic cigarettes: human health effects". Tobacco Control. 23 (Supplement 2): ii36–ii40. doi:10.1136/tobaccocontrol-2013-051470. ISSN 0964-4563. PMID 24732161. 1 2 Hajek, P; Etter, JF; Benowitz, N; Eissenberg, T; McRobbie, H (31 July 2014). "Electronic cigarettes: review of use, content, safety, effects on smokers and potential for harm and benefit." (PDF). Addiction (Abingdon, England). 109 (11): 1801–10. doi:10.1111/add.12659. PMID 25078252. ↑ Burstyn, I (9 January 2014). "Peering through the mist: systematic review of what the chemistry of contaminants in electronic cigarettes tells us about health risks.". BMC Public Health. 14: 18. doi:10.1186/1471-2458-14-18. PMC 3937158 . PMID 24406205.